On the 20th (Thu), kick back and relax at Praia do Carneiro, snap pictures at Ponte de Dom Luis I, make a trip to Pelourinho Se Catedral Porto, then contemplate in the serene atmosphere at Porto Cathedral (Se Catedral), and finally admire the landmark architecture of Palacio da Bolsa. On the 21st (Fri), you'll have a packed day of sightseeing: stroll through Mindelo Beach. Toronto, Canada to Porto is an approximately 10-hour flight. The time zone changes from Eastern Standard Time to Western European Time, which is usually a 5 hour difference. Expect a daytime high around 27°C in September, and nighttime lows around 15°C. Cap off your sightseeing on the 21st (Fri) early enough to catch the train to Lisbon. You'll discover tucked-away gems like Convent of Christ and Batalha Monastery. Do some cultural sightseeing at Capela dos Ossos and Belém Tower. Explore the numerous day-trip ideas around Lisbon: Ginginha do Castelo (in Ourem), Cabo da Roca (in Colares) and Evora (Se Catedral de Evora, Sao Joao Evangelista Church, & more). And it doesn't end there: take in the spiritual surroundings of Jeronimos Monastery, admire the striking features of National Pantheon, tour the water at your own pace with Nosso Tejo, and wander the streets of Alfama. To find reviews, more things to do, traveler tips, and other tourist information, read Lisbon travel planning website . You can take a train from Porto to Lisbon in 3 hours. Other options are to fly; or drive. Traveling from Porto in September, expect nights in Lisbon to be about the same, around 19°C, while days are a bit warmer, around 32°C. Finish your sightseeing early on the 27th (Thu) to allow enough time to travel to Praia da Vitoria. Praia da Vitória, translated as the Beach of the Victory, is a municipality in the Portuguese archipelago of the Azores. On the 27th (Thu), tour the pleasant surroundings at Escaleiras Beach and then stroll through Vitoria Beach. To find ratings, traveler tips, where to stay, and more tourist information, refer to the Praia da Vitoria itinerary builder . Use the Route module to find suitable travel options from Lisbon to Praia da Vitoria. The time zone difference moving from Western European Time to Azores Time is minus 1 hour. Traveling from Lisbon in September, expect nights in Praia da Vitoria to be about the same, around 22°C, while days are little chillier, around 28°C. Wrap up your sightseeing on the 28th (Fri) to allow time to travel to Ponta Delgada. Start off your visit on the 29th (Sat): contemplate the waterfront views at Natural Pool, kick back and relax at Mosteiros Beach, and then explore the striking landscape at Caldeira das Sete Cidades. 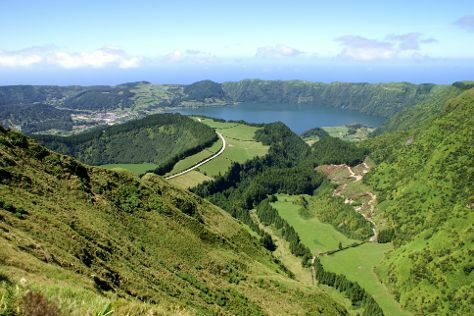 Keep things going the next day: contemplate the waterfront views at Lagoa do Fogo, then admire the natural beauty at Terra Nostra Gardens, and then take in the dramatic natural features at Poca Da Dona Beija. For more things to do, maps, other places to visit, and other tourist information, use the Ponta Delgada day trip app . The Route module can help you plan travel from Praia da Vitoria to Ponta Delgada. Expect a daytime high around 28°C in September, and nighttime lows around 20°C. Finish up your sightseeing early on the 30th (Sun) so you can travel back home.